Lock in a great price for Redwood Bed and Breakfast – rated 9.7 by recent guests! The breakfasts were very good. Fluffy pancakes, sausages, eggs, quiche, Canadian bacon, and an assortment of fruit, muffins, coffee and juice. The location is a short 5 minute drive to the falls and just about everything else. FREE PARKING! This is a big plus when you consider that just about every other hotel in that area charges $30-40 a day to park. No resort fees. Stayed in the “Paris” room which overlooks the Niagara Gorge (photo attached) and has its own bathroom and outside deck. The owner Maria was very friendly, welcoming & helpful. The place was very nice & clean. Breakfast was very good. The breakfast was absolutely amazing. It tasted like it was made by a professional chef and the hosts really took the time to get to know you on a personal level. A bang for your buck! You get so much for the cost you pay for. Hard to find such a great place like this one. The owners were amazingly nice. The room (Paris room) had a big living room and bedroom, both with private balcony walkouts. Everything was clean and well maintained. And the breakfast was amazing - both the food and the company. The owners sit with the guests and the conversation was great. the lady marie was very helpful. room was nice and bright. made a nice breakfast. would maybe like some eggs . Gorgeous home, wonderful owners, and delicious breakfast!!! Breakfast was the best I ever had and the hosts were fantastic. Location was close to everything but quiet. The breakfast was amazing and the host's were very attentive to detail. It was very evident that they loved what they did and cared about their guests. Maria and her mother are very personable and help bridge any differences between guests. The breakfast was excellent. Very clean. Bed comfy. Owners personable and accommodating. 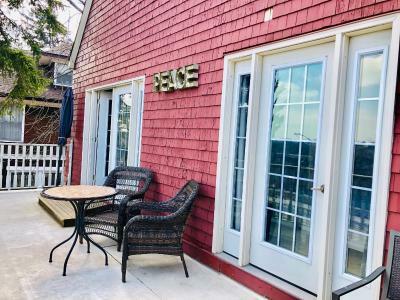 Overlooking the Niagara Gorge, this bed and breakfast is just a 2 minute drive to Niagara Falls. A hot breakfast is served daily. Victorian-style rooms come with cable TV. An private bathroom is featured in each romantically decorated room at Redwood Bed and Breakfast. Hardwood floors are accented with soft colors. Free Wi-Fi is also provided. Eggs Benedict and omelets are among breakfast specialties at Redwood B&B. Homemade jams and hot croissants are also served, along with coffee, tea or juice. Casino Niagara is about a 15 minute walk from this bed and breakfast. Thundering Waters Golf Club is a 10 minute drive away. 뀐 Located in the top-rated area in Niagara Falls, this property has an excellent location score of 9.7! When would you like to stay at Redwood Bed and Breakfast? Complete with a balcony overlooking the Niagara gorge, this room features hardwood floors and dark cherry furniture. A Victorian-style bathroom and living area are included. Free Wi-Fi provided. Please note that the room rate is based on 2 adults. Maximum occupancy is 4 guests (see Hotel Policies). This room features a four-poster bed, hardwood floors and private bathroom. Free Wi-Fi provided. This bright room features an private bathroom and sitting area with a Victorian-style table. Free Wi-Fi provided. House Rules Redwood Bed and Breakfast takes special requests – add in the next step! Redwood Bed and Breakfast accepts these cards and reserves the right to temporarily hold an amount prior to arrival. Only children aged 10 years or older can stay at this B&B. Please see policies for children/extra person charges. Maybe it’s how B&B’s operate in Canada, but we never got a visit from housekeeping. By the end of our 4 day stay, all the trash receptacles were full. Everything exceeded my expectations. 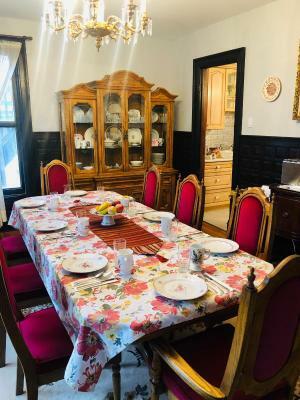 Maria and her mother were wonderful hosts, the room was quaint and comfortable, the breakfast was incredible and Maria confirmed any dietary restrictions and was able to accommodate beautifully. Very nice place, and gentle family. We felt very welcome. That I only spent there 2 nights. A fan in the room. and a smoke detected that wouldn't go off when your sleeping. tv that works. Marie that runs the bed and breakfast did fix the problem with smoke detected . and try to get the tv to work better. The house is old and even though it has been fully modernized and is comfortable, it does sometimes suffer from noise traveling one room to the other. The hostess's carefully prepared breakfast every day is delicious.And it's all organic. The room is in a particularly delicate style.Very vintage and romantic！Clean rooms and clean supplies. Anyway, everything is fine, thank you! Owners were exceptionally nice made our stay very memorable. Breakfast was very good and plenty to eat.